throughout the year, where each monthly value is itself obtained by selecting, for each given location, the day when the NDVI is maximum during the month (Loveland et al., 1999). Other approaches use directly the spectral dimensions, generally provided by a red and a near-infrared channel (Belward et al., 1990, Ehrlich and Lambin, 1996). Alternative but still exploratory methods exclusively based on a physical interpretation of satellite data sets have been proposed (Gobron et al., 1997 and Gobron et al., 2000b). Whenever vegetation indices are used for this purpose, and independently from the technique applied later for land cover analysis, the use of optimized indicators such as SeaWiFS-VI is fully justified since, at the very least, the latter permit the construction of data sets which are less corrupted by undesirable effects of atmospheric and directional origin. 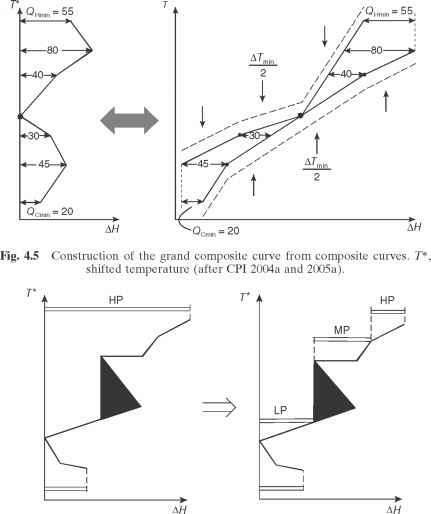 The sensitivity of classical vegetation indices to such perturbations has long been known and extensively documented (see, for instance, Flasse and Verstraete, 1994, Meyer et al., 1995 and Cihlar et al., 1998), and the desire to decrease these sources of noise constituted the original motivation for compositing techniques such as the maximum NDVI described earlier. To the extent that the SeaWiFS-VI is constrained to fit the FAPAR of the simulated canopies in the simulated data sets, it is likely that the values computed with this index on the basis of actual sensor data will reflect the diversity and spatial distribution of the vegetation and land cover type present in the environment. Of course, this assertion applies only whenever transitions between biome types effectively lead to detectable gradients in FAPAR, either in space or in time. For the sake of the demonstration, we compared, at the regional scale, our SeaWiFS-VI products with a map produced in the context of the Forest Monitoring in Europe with Remote Sensing (FMERS) project which aims at identifying the forests in this region. 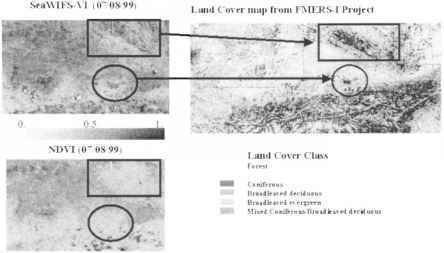 The FMERS maps are derived from the analysis of one year of data gathered in 1997 by the high resolution IRS 1C WIFS sensor and ancillary ground-based observations (see Hame et al., 1999). This constitutes an independent source of information considered a priori adequate to evaluate the suitability of the SeaWiFS-VI for identifying forest patterns. Figure 7 shows that the various forest classes identified by the FMERS project (panel b) are clearly distinguishable on the SeaWiFS-VI derived map (panel a). Note that the latter is produced from SeaWiFS data acquired during a single orbit on August 7, 1998. The map of the corresponding NDVI values (panel c), computed on the basis of the same SeaWiFS data, and using the same color scale, shows patterns that are not immediately related to the FMERS map. These two applications illustrate the potential benefits of applying optimized indices in general and SeaWiFS-VI in particular to address land cover issues. The major advantage over classical indices is basically a significant increase in the dynamics of the desired information versus the amount of noise due to various perturbing sources. The analysis of spatial and temporal index variations in order to delineate seasonal land cover regions (Loveland and Belward, 1997) is rendered much more reliable and informative due to the noise reduction in the index. It is thus anticipated that the systematic analysis of the global SeaWiFS-VI database will be worthwhile to document land cover changes.